Advance Auction Open Now for Wet Paint 2019! Advanced Bidding for nearly 90 pieces local art is open now! For the first time ever, members of the Arts Council can bid on work for the Wet Paint Party & Sale early! Use the link below to login, check your membership status, and view the live auction. Need to join or renew your membership? You can do so at the same link. Note: You will not be able to view the Wet Paint Art Auction online until you are a current member. 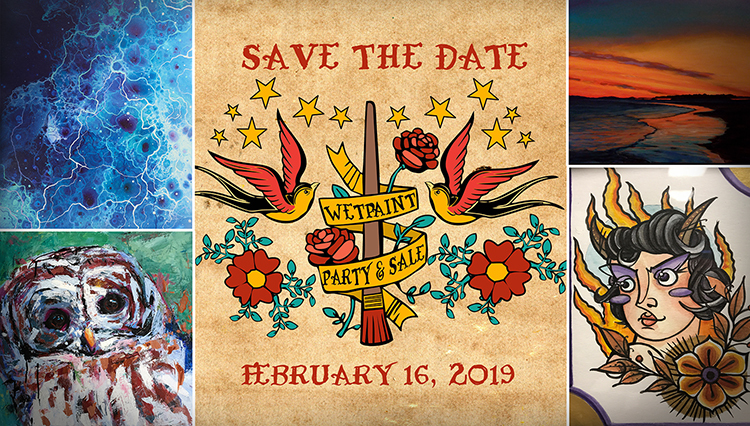 89 pieces of art by local artists will be for sale in the 2019 Wet Paint Party and Art Sale, being held Saturday, February 16 7-10:30 at the Sacred Heart Cultural Center. Vintage Ooollee is bringing classic retro fashion, DJ Codec will play fun rockabilly tunes, and Cucina 503 is providing delicious food! Sacred Heart Cultural Center, 1301 Greene St.
Free for Members of the Arts Council! Join at the door, or skip the line by joining at the link above. Want to Help us put on one of Augusta’s best art parties? We are still looking for volunteers to help throughout the night. Short Shifts make it possible to have a great time while helping out!